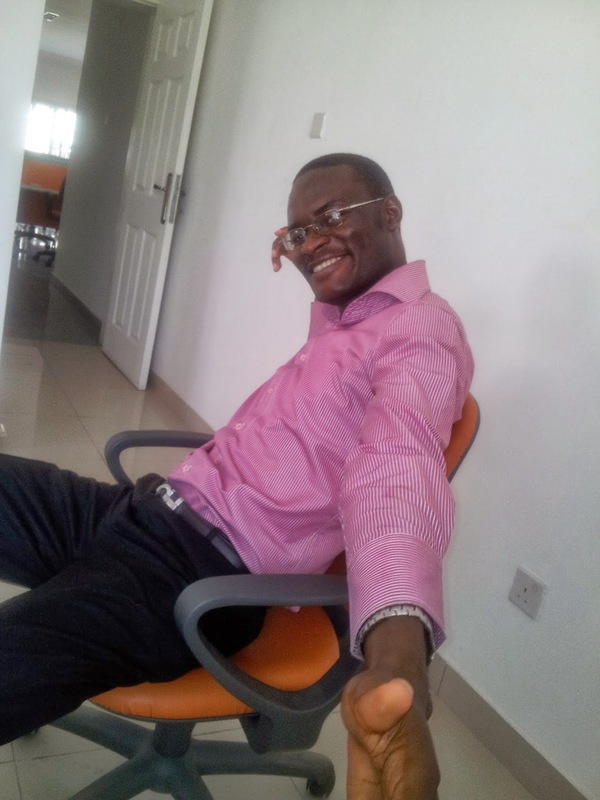 Yesterday I conducted an Excel training for LeapAfrica. I couldn't have gotten a better audience/trainees. Looking at all the Excel trainings I have conducted, my best experiences have been training people who use Excel a lot in their jobs. They value everything I say, every keyboard shortcut I show them and often see me as a magician. Today I'm going to share one of the things I was asked to explain. In the training PPT (PowerPoint file) I used, I inserted all the Excel practice files in the PPT slides. 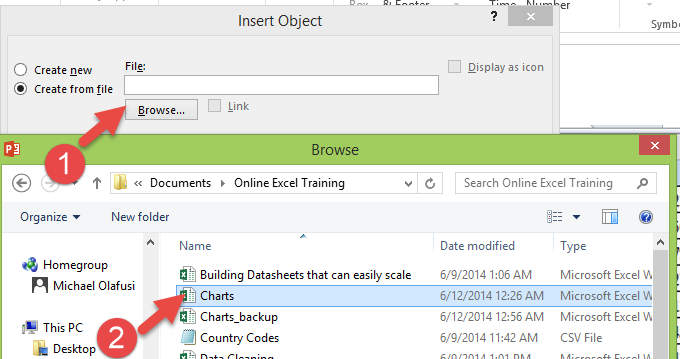 So by just giving you the PPT, you will also have all the Excel practice files you need to follow along. 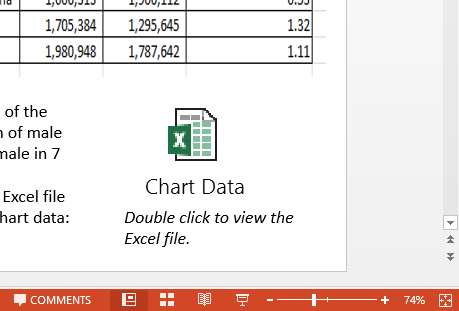 For example, the slides on how to make Excel charts had a practice Excel file, to explain practically what I have in the slides, I simply double click the Excel file icon on the slide and it opens in Excel. I was asked how I inserted the Excel file. 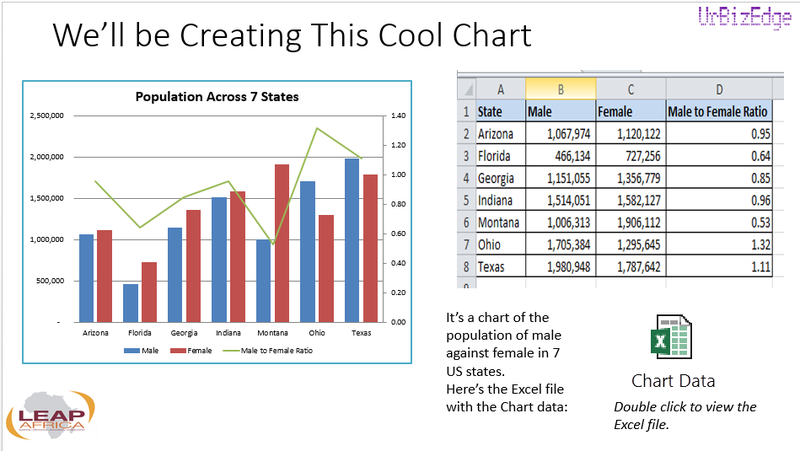 So how do you insert an Excel file into a PowerPoint slide? Go to Insert menu, and click on Object on the far right. You'll get a dialog-box. Click on "Create from file". Browse to the Excel file you want to insert. And select it. Then tick "Display as icon". And "Change Icon". 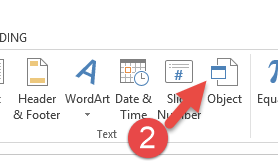 Type in the name you want the Excel file to show in the PPT slide. And that's all! You've successfully inserted an Excel file into a PowerPoint slide. 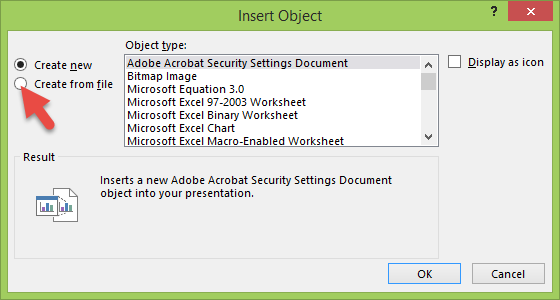 The best part is that you can use this same procedure to insert a Word file or some other type of file into PowerPoint. If you signed up for the soon to begin free Online Excel training, I hope you've gotten an email detailing how the entire training will be done. It has not been easy making the videos. I now sleep at about 2:00am daily.